Born and raised in Southern California, by a hearing impaired single mother and her family, I spent most weekends at the Ocean. Even when I knew we could not afford it, my Mother said, “the beach is free, and I’ve already made deviled egg sandwiches.” I was raised around my grandparents, their 9 grandchildren and dairy cows. We were pretty regular, no terrible people or drama in my family. As an adult I spent a decade in Hollywood and the surrounding beach cities. I’ve had wonderful relationships, friends, neighbors and bosses. In 2012 I found myself working 4 to 5 jobs and could not afford car insurance. Life wasn’t too terrible, as I love the Hotel I worked in, I had landed some commercial modeling gigs, I spent my spare time sewing Machado Handbags, which were sold in high end stores on sunset plaza drive, and cool beach shops. I felt successful and strapped on cash. I attended a conscious life expo to fulfill that empty spiritual side of me. While looking at handouts from that event, I found ic.org, a directory for intentional communities. As soon as I realized that community and ecovillages existed and didn’t die with the sixties; every cell in my body knew; that was for me, that’s how I am suppose to live. I took the next six months to quit my jobs, sell my possessions, pack up my vehicle and drive across the country to find “Home”. I made a list of a few communities I was going to visit, feeling like, I liked aspects of each one. The first community I went to was a Hare Krishna community in West Virginia where I thought I was going to learn Ayervedic farming practices which would make me an asset to community. There I met Jaya whom has visited many intentional communities as a facilitator for meetings. Jaya suggested to me that I add Dancing Rabbit Ecovillage to my list of communities. 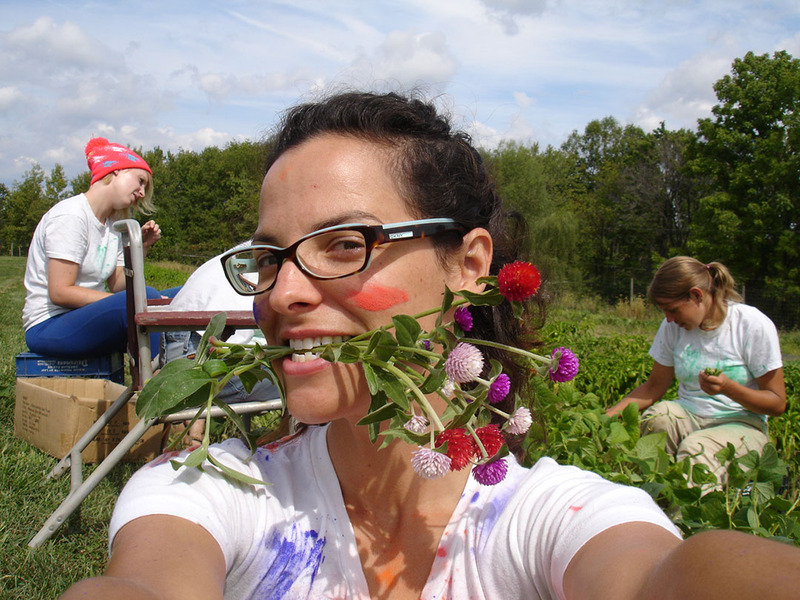 Dancing Rabbit Ecovillage had the perfect culmination of attributes that I was interested in. I visited on 10/11/12 and moved here on 12/12/12; neither of which I had planned, but definitely took guidance from, assuring me that I was on my path, in the vortex of manifestation. I meet my partner iLLLy in the same visitor group, it was relationship at first sight. We began designing a timber frame and straw bale home together, me in Dancing Rabbit and iLLLy in California, Selling his home and disconnecting from Babylon. In Spring of 2013 I began prepping the site of our warren, iLLLy arrived in June, by August we had a 10 day workshop with 9 students and a timber framing instructor. In November, it got too cold to continue building, so we moved into our unfinished home, then road the train to California to meet each other’s families. Spring of 2014 rolled around, we moved into a tent in our front yard and continued building. November caught us earlier than expected, so we are yet again moved into our unfinished home, only to continue building next spring. I never knew I would love being a natural builder; crafting a dwelling like a sculpture. Now my life in community is so fulfilling! Every day I am able to choose how I want to spend my time, there is never a dull moment between gardening, preserving food, making medicine and crafts, hiking, volunteering for the nonprofit of Dancing Rabbit Inc, with a mission to spread sustainability. I have a rich social life with people I consider soul family, time with them is soul food. We celebrate the abundance of life constantly. Life here is truly what I make of it. The only thing this place is missing for me, is you!